The experimental landing of the stage ended in a blaze of fire after the booster made contact with its Drone Ship landing platform. 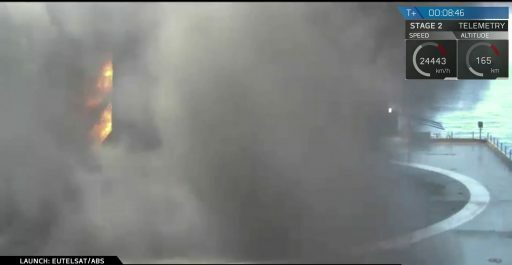 Green flames erupted from the 70-meter tall rocket as it came to life at 14:29 UTC and blasted off on the power of its nine Merlin 1D engines affixed to the business end of the massive first stage. Making its fifth launch from Florida this year, Falcon 9 took the standard path to GTO, traveling east-south-east to depart Cape Canaveral – firing its first stage for just over two and a half minutes before handing duties off to the MVac engine on Stage 2. 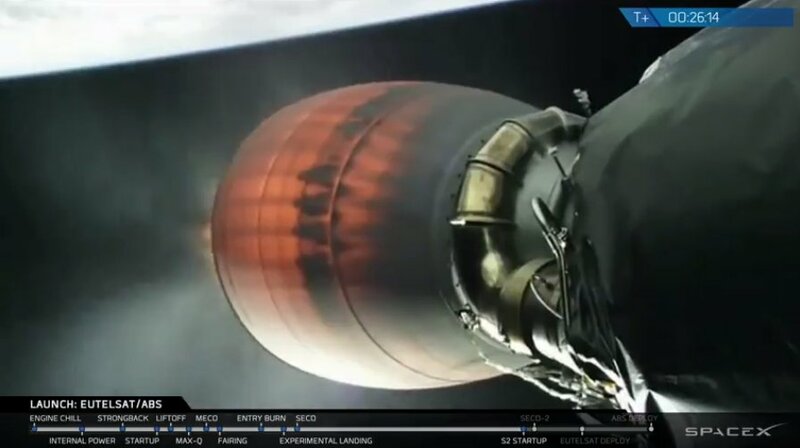 Topped with the Eutelsat 117 West B and ABS 2A satellites, the second stage fired up its engine, dropped its payload fairing and continued burning for six and a half minutes to reach a preliminary Parking Orbit. The engine re-started after a 16.5-minute coast to lift the orbit’s high point and decrease its inclination to the equator to deliver the two all-electric satellites to a Supersynchronous Transfer Orbit with separation taking place 30 and 35 minutes after launch, respectively. Stage 1 had another adventurous landing to look forward to after dropping away from the second stage. As a high-energy GTO flight, this mission again had the booster fly on a ballistic arc until re-lighting three of its engines for a brief re-entry burn to slow down prior to hitting the dense atmosphere. With its four actuated grid fins, the rocket guided itself to the precise coordinates of the Autonomous Spaceport Drone Ship that was holding position out in the Atlantic, awaiting the rocket’s arrival. Three engines fired to rapidly slow the booster down followed by the deployment of the four landing legs and the cutoff on the two outer engines to continue descent on the center engine alone. 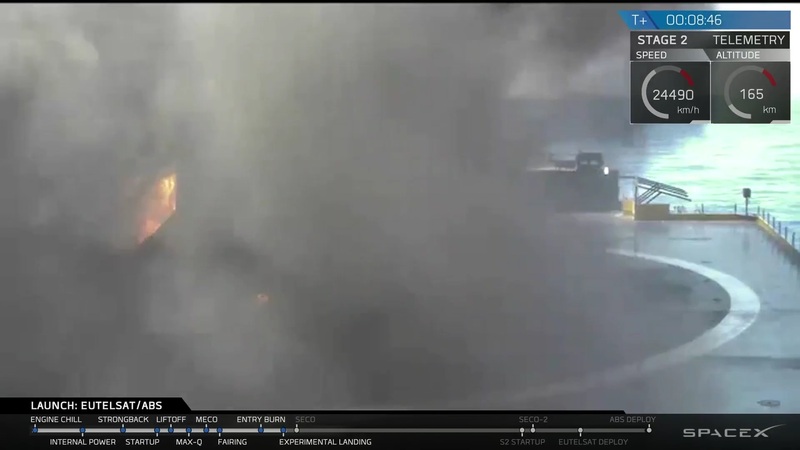 A sequence that provides almost zero margin for error did not end with a successful landing on Wednesday – the booster appeared to stand upright but was surrounded in a blaze of fire and did not survive intact. With five Cape launches and another from Vandenberg in the first half of 2016, SpaceX has been successful in setting up a high cadence of missions – a critical requirement for the company when looking at its booked manifest. A launch every three or four weeks from either of SpaceX’s launch pads is the goal and the SLC-40 operation appears to be running at the envisioned tempo, supporting three launches in under six weeks. SpaceX is currently working to ramp up operations on its West Coast launch site, SLC-4E at Vandenberg Air Force Base. The first flight of the Falcon 9 FT from Vandenberg recently slipped to mid September and will involve the delivery of ten Iridium NEXT Low Earth Orbit Communications Satellites. SpaceX holds contracts for seven Iridium launches, all to be completed before the end of 2017 using the Vandenberg launch and landing sites. Two more Vandenberg launches, Iridium NEXT Flight 2 and the launch of FORMOSAT-5 & secondary payloads, are on the books for 2016. 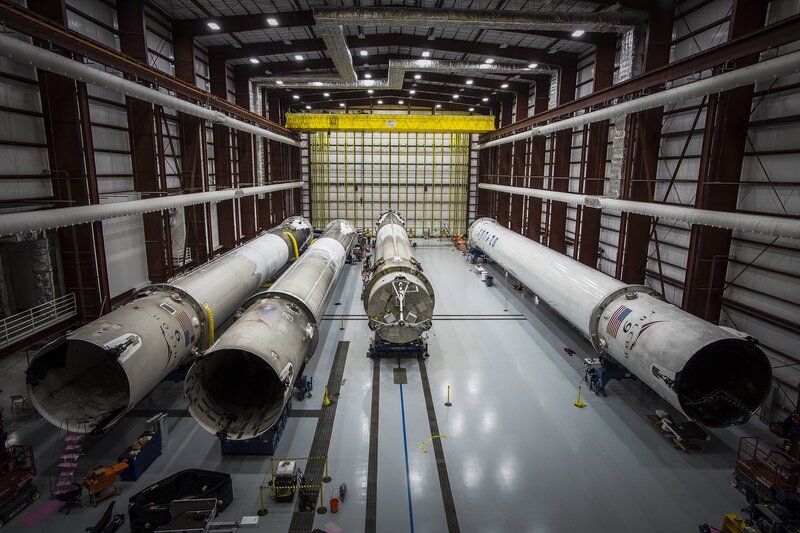 While the Iridium missions will be carried out with brand new Falcon 9 cores, SpaceX currently hopes to re-fly its first booster in the September/October time frame on an operational satellite-delivery mission. 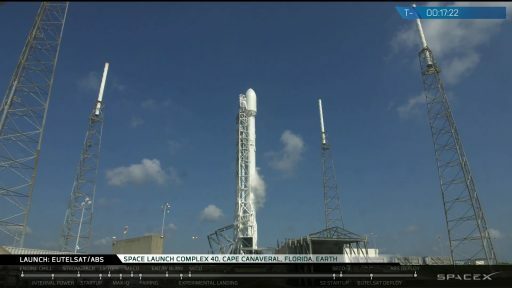 No customer for that launch has been announced, however, satellite operator SES noted the company was interested in becoming the first to fly on a refurbished Falcon 9 and currently has two satellites lined up for launch in that time frame. Other companies have already gotten in line to secure future opportunities of flying on used boosters. With the re-use business model gaining a broad customer base, SpaceX continues full steam ahead in the company’s continuing development program for efficient and quick turnaround of its boosters to achieve safe re-flight at minimal cost – a revolution in the commercial spaceflight business if successfully implemented. To demonstrate the company’s recovered boosters are capable of going through the rigors of ascending to the edge of space and blazing back to a landing on land or in the ocean, SpaceX plans to complete extensive testing on the boosters it already returned. While the OG2 booster that became the first to make a successful landing back in December will go to SpaceX HQ to be put on display, its companions are looking forward to extensive testing campaigns. 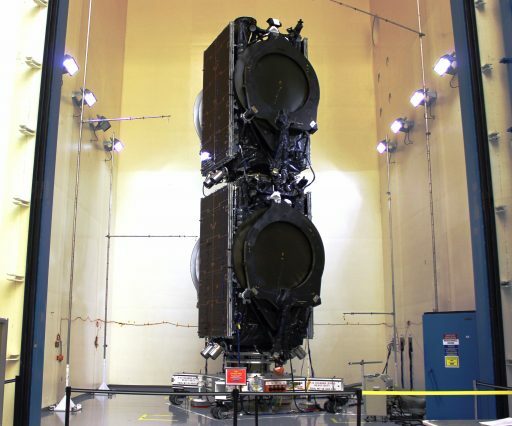 The JCSat-14 and Thaicom 8 boosters will complete testing on the component level as well as Static Fire tests to qualify booster components for re-flight and expose areas where additional reinforcements are needed for the vehicles to better cope with challenging entry environments. First to take flight in an operational mission again will likely be the Dragon SpX-8 booster that encountered a benign re-entry and is therefore in the best condition of the lot. 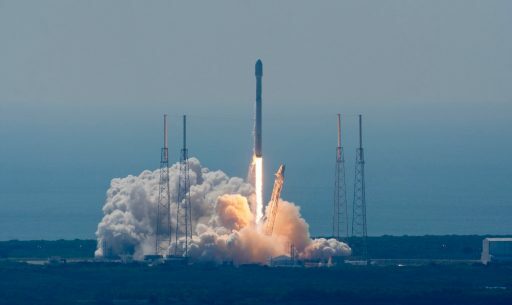 Wednesday’s mission marked SpaceX’s second dual-payload flight to GTO as the company is less inclined to support multi-customer flights due to schedule risks arising in case of delays with one of the passengers. 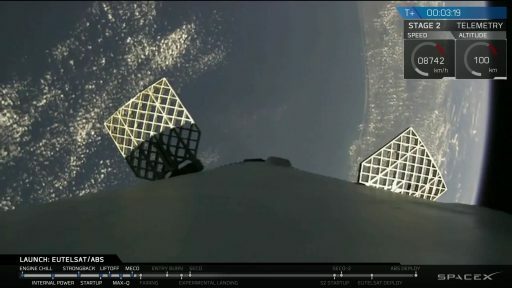 However, with both satellites from a single manufacturer and delivered as a single-piece stack by Boeing, SpaceX was more or less able to treat the mission as a standard single-payload launch. Dual-launch capability is an inherent feature of Boeing’s BSS-702SP satellite bus that reduces spacecraft mass to enable customers to share the cost of a single launch vehicle. Boeing developed its own adapter system that joins the two satellites and provides satellite separation when arriving in orbit. The physical adapter remains attached to one of the two nearly identical satellites that have a combined mass of around 4,100 Kilograms. The BSS-702SP satellites rely on electric propulsion, featuring XIPS-25 ion thrusters for their transition from GEO Transfer Orbit to their high-altitude perch in Geostationary Orbit. Ion thrusters are more efficient but lack the thrust of chemical propulsion system, creating a longer transfer time into GEO, planned to be on the order of half a year for the two satellites. 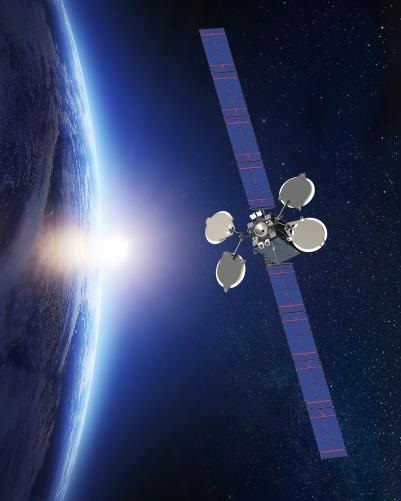 Eutelsat 117 West B will take its position at 116.8 degrees West in Geostationary Orbit, using a powerful Ku-Band payload with 48 transponders to deliver Direct-to-Home Television Services to Latin America with particular focus on the Mexican market. ABS 2A will reside at 75° East and also hosts a 48-transponder Ku-Band system to deliver five high-power spotbeams for DTH and VSAT services. 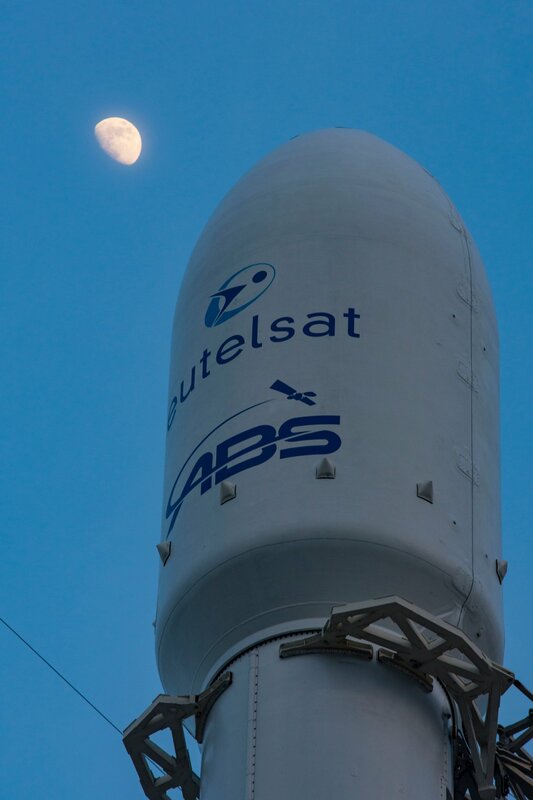 Wednesday’s launch was the second time satellite operators Eutelsat Americas and Asia Broadcast Satellite were sharing a Falcon 9 after the successful April 2015 launch of Eutelsat 115 West B and ABS 3A, back then using the Falcon 9 v1.1 version. 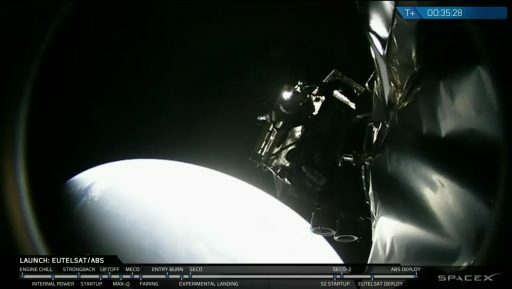 Having upgraded to the Falcon 9 FT version, SpaceX could launch the two satellites and preserve sufficient fuel for the secondary objective of landing the first stage on the Drone Ship that had departed port on Friday and was awaiting the arrival of the booster 680 Kilometers from the launch pad. Falcon 9 rolled from its hangar to the launch pad on Tuesday and was placed in a vertical position in the evening to head into the early hours of a lengthy countdown, beginning with a full checkout of the vehicle and all its systems. Range Controllers at the Morrell Operations Center initiated the Eastern Range Countdown at L-4 hours to monitor the launch zone and downrange corridor. 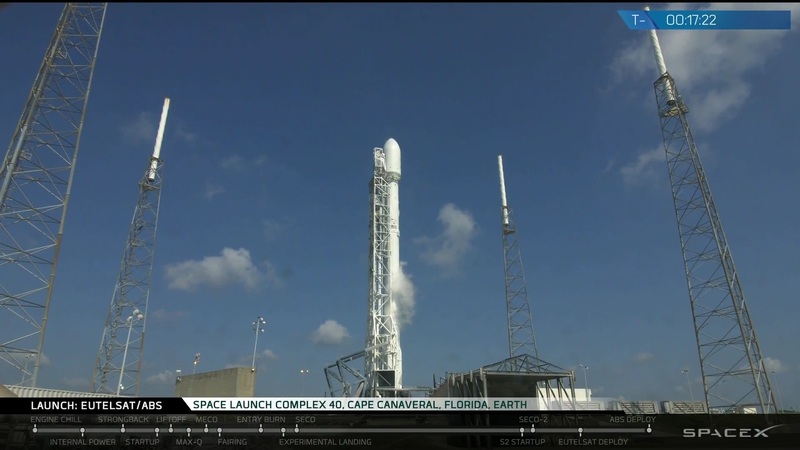 Once the launch complex was clear and the vehicle finished checkouts, Falcon 9 headed into tanking preparations to be ready for the expedited propellant loading operation picking up at T-35 minutes. All Stations voiced a GO for fueling of the two-stage rocket and over 500 metric tons of sub-cooled Liquid Oxygen at -207°C and Rocket Propellant 1 chilled to -7°C were loaded in a sequence leaving no margin for error as fueling was set up to close out just minutes before launch. Prop load went through a careful throttling sequence adjusting the first and second stage flow rates while the two satellites made their transfer to battery power. 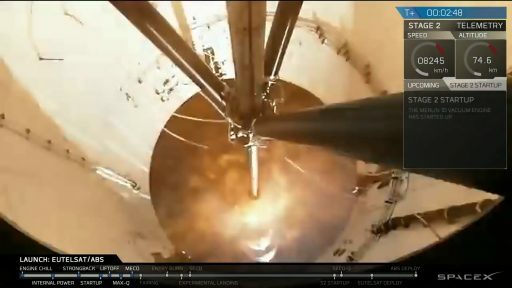 Getting close to ignition, Falcon 9 finished the chilldown of its nine engines, transferred to internal power and assumed control of the countdown. LOX loading closed out at T-2 minutes, just in time for the pressurization of the tanks for liftoff. The characteristic green flames of Falcon’s igniter mixture erupted from the engines as turbopumps spun up and combustion was triggered within the nine engine chambers. 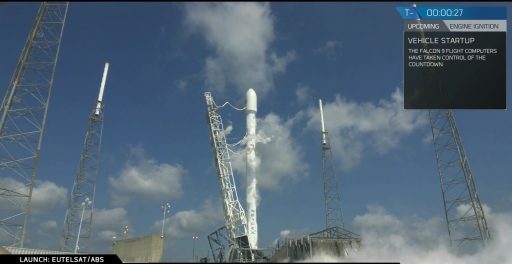 Liftoff occurred at 14:29:00 UTC when Falcon 9 was released from its pad to begin the climb to orbit. 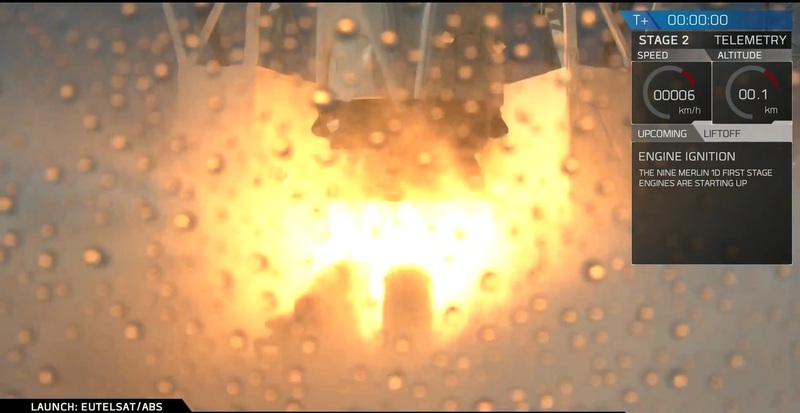 Generating 694,000 Kilogram-force of liftoff thrust, the nine Merlin 1D engines were gimbaled to keep the vehicle upright ahead of the pitch and roll maneuver to put Falcon 9 on an east-south-easterly trajectory. The rocket passed Mach 1 just over a minute into the flight and throttled down its engines for around 20 seconds when encountering Maximum Dynamic Pressure to reduce stress on the vehicle. Acquisition of signal by the Drone Ship was confirmed just as the MVac engine on the second stage started chilling down for its ignition – its smaller companions on the first stage were still firing at full throttle at that point, guzzling down nearly 2,500kg of propellant per second. MECO, Main Engine Cutoff, was completed at T+2 minutes and 37 seconds after a clean first stage burn, lifting the vehicle to 66 Kilometers, boosting it to a speed of Mach 6.8. Four pneumatic pushers then separated the stages followed by the ignition of the 95,000 Kilogram-force MVac engine to continue pushing the satellites into orbit. Separation of the payload fairing occurred three and a half minutes after launch, exposing the stacked satellites on their way into orbit. Immediately after dropping away, the first stage pulsed its cold gas thrusters to enter its flip, pointing the tail to the direction of travel to set up for re-entry. The four actuated grid fins deployed while the stage was still in its flip maneuver as seen on live video downlinked from the booster. As has become standard for GTO deliveries, Falcon 9 continued on a ballistic arc since no propellant reserves for a boost back or braking maneuver were available. Ignition on a 20-second re-entry burn involving three Merlin 1D engines was confirmed just past T+6 minutes – starting the process of slowing the vehicle down from. Slamming into the dense atmosphere, the first stage encountered high thermal loads as evident in smoke obstructing the camera view from the booster. The four grid fins then swung into action to modify the vehicle’s flight path, precisely targeting the coordinates of the Drone Ship that held position with four powerful azimuth thrusters. Ignition on the three-engine landing burn came after T+8 minutes, aiming to rapidly slowing the booster to a point where two engines were cut off for descent to continue under the power of a single engine to create a manageable thrust-to-weight ratio. However, as Elon Musk Tweeted after the flight, thrust on one of the three engines was low and Falcon 9 could not slow down as expected. Because of the very tight margin of the three-engine landing maneuver, Falcon 9 did not have room to compensate and landed hard, likely causing structural damage. Live video from the barge cut out as the rocket’s exhaust impinged upon the communication assets. When video returned, Falcon 9 was standing upright atop the Drone Ship but was surrounded in a blaze of fire. What followed was what rocket engineers call RUD – Rapid Unscheduled Disassembly. It remains to be seen whether some components like the heavy engine section survived, but the critical landing data was safely captured and will help SpaceX improve the landing sequence for future fuel-critical missions. Musk noted that work was underway to give the booster the ability to dynamically compensate for a thrust shortfall on one of the three engines, an improvement to be introduced by the end of the year. Focusing on the delivery of its two satellites, the second stage concluded its first burn nine minutes and 11 seconds after liftoff, heading into a 16.5-minute coast to set up the proper position for the second burn, aiming to place the apogee of the elliptical transfer orbit above the equator, meaning that the orbit-raising maneuver also had to occur centered around the equator passage. Re-start of the engine at T+25 minutes and 54 seconds was by the book and the 64-second burn involved active throttling of the MVac engine to maintain a maximum acceleration of 5Gs. The primary goal of the second burn was to raise the orbit’s apogee above the Geostationary Belt and reduce its inclination, reducing the time needed by the satellites to enter GEO. No target orbit parameters were provided for this mission but it is understood that Supersynchronous Transfer Orbit was being targeted, similar to the 2015 flight. The mission concluded with the successful separation of Eutelsat 117 West B 30 minutes after liftoff and ABS 2A five minutes later, leaving only passivation to be completed on the second stage after the two satellites were sent on their 15-year missions. 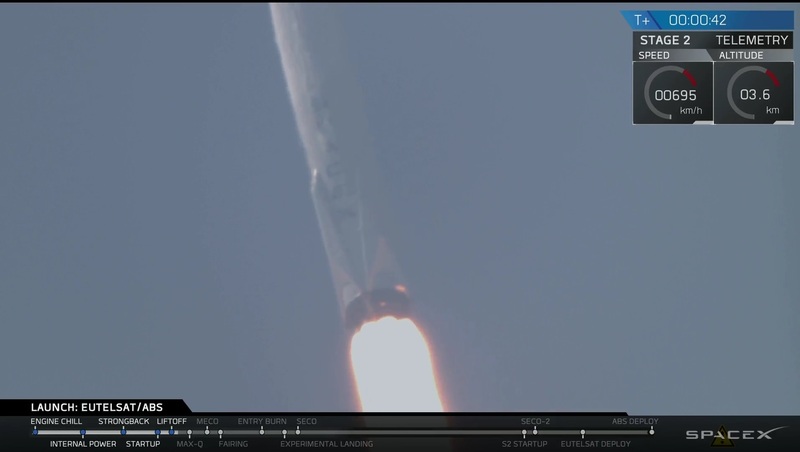 Wednesday’s launch marked the sixth flight of the Falcon 9 FT vehicle, the next is currently on the books for July 16 when SpaceX will begin its next cargo mission to the International Space Station.